Add the saffron to the hot stock and let it steep for 1o minutes. In a deep sided saute pan, gently fry the chorizo until it starts to brown a little and releases some of it's fragrant fat and juices into the pan. Add the shallot, chopped chilli, and garlic and gently fry them for 2 or 3 minutes until soft, but not browned. Add the rice, and a pinch of salt, and stir it around the pan until it is coated with the oil and juices and mixed with the chorizo, shallot, and garlic. Fry gently for 1 minute. Add the vermouth and scrape up any bits from the bottom of the pan. Cook gently for another minute. Add the green beans and sweet red peppers, and pour in the stock and simmer for 10-12 minutes, stirring now and then. 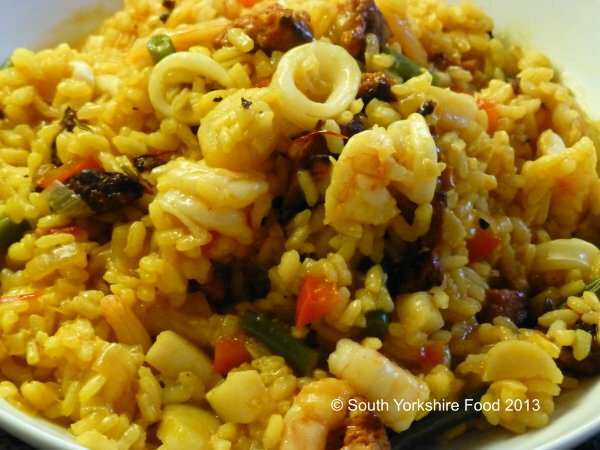 Some paella rice takes longer than others, but what you are aiming for is almost cooked with a little liquid left. Now add the seafood and mix well with the rice. Let it continue cooking for another 2-3 minutes. This should be enough cook the seafood perfectly, and absorb the remainder of the liquid. Cook a little longer if required. Season with black pepper and serve with a dressed green salad.